The Duke is a 2-player abstract tile game, for ages 13 and up (though I suspect that age recommendation is artificially high due to pieces and manufacturing guidelines). I think this would work just fine for younger kids. It takes 15-30 minutes to play—though we’ve seen games that were shorter and games that took longer. The goal is to capture the other person’s Duke. A black filled-in circle is a Move—which means that tile can move to that black circle space. The tile can’t jump over or go through any pieces—friendly or enemy—but if there is an enemy tile in that space, you can move there and capture the enemy piece. A filled-in triangle is a Slide, which means that tile can slide any number of squares in the direction the triangle is pointing, as long as there’s nothing in the way. It has to stop once it hits a friendly tile, or it can capture an enemy tile if it lands on it. A star icon is a Strike. That means the tile can stay right where it is, and “strike” at the space where the star is—capturing a piece there. Some squares have small triangles in the corner, which offer Command. A Troop with this icon can move other tiles around it. Instead of moving itself, it can move another friendly Troop to the square that has that Command icon. If that moves a Troop onto an enemy, it’s captured. There is also a Dread and a Defense icon, but none of the Troops in the base game come with that icon, so we’ll leave it for an expansion review. Perhaps the most interesting aspect of the game is that as soon as a Troop moves or activates, it flips over to its other side, where there’s a whole new set of icons. It might be different icons and they’re certainly in different spaces: Every tile looks different on the its other side. Each player takes out the Duke, and two Footmen. You must place the Duke in your own back row, in one of the middle two spaces. Then you set up the Footmen so they’re touching the Duke orthogonally. And that’s it for setup. From that point on you can do one of two things on your turn: activate a Troop Tile, or draw a new Troop Tile. If you activate one, you simply move it—or in the case of Strike and Command, you…do stuff), and then you flip the tile. If you draw a new one, it has to be placed orthogonal to the Duke, wherever he is. This continues on until someone captures the other player’s Duke. There are a few variations included in the box. There’s a Mountain tile that blocks movement from everyone; it’s just there to get in the way. There’s a Dragon tile that acts as an outside force. It moves across the board, and if you sacrifice a piece to it, it becomes ENRAGED and starts wrecking the joint. There are some Flag tiles so you can play Capture The Flag. And there are a couple of alternate tiles you can use, with some advanced rules. Firestone—I’m so excited! I finally like a game! Okay, I’m not that bad, but seriously: I like this game. A lot. I was immediately taken with it. It’s simple and deep, elegant and wonderful. Jeremiah—I’m so excited too, I thought I might have to resort to violence if you didn’t like this one. It took me about 1.2 seconds to know that I was going to love this game. And I do. It’s simply great. Firestone—I’ve never liked chess. It’s boring. (Try and convince me otherwise; you won’t be able to.) Everything is right there on the board, so people who can think three steps ahead are at an advantage—which puts me at a disadvantage… While The Duke is also an abstract where you’re trying to capture one piece on the board using “troops” of varying strengths and abilities, The Duke is so much more dynamic and interesting to me. Not least because of the tile draws, which add an element of uncertainty and randomness. Jeremiah—I find it very curious that you enjoy this game due in part to “uncertainty and randomness”…but that’s another conversation. I think what makes the random nature of this game so great is that the tiles in your bag are so evenly balanced, that even if you don’t pull the perfect tile it’s still very useful and could leverage the game in your favor. This game is masterfully designed! Firestone—Last week, people in my game group played this half-a-dozen times. It was a big hit, and the go-to filler when people needed to kill some time. It’s quick, and easy to learn, and just fun. Jeremiah—Yeah, I really enjoy the fact that in about 3-5 minutes I can teach someone everything they need to know about the game, and from that point on it’s a matter of outwitting/out-positioning your opponent. I will say, the more you play and familiarize yourself with the tiles it does give you an advantage, though. Because you’re not allowed to pick up your opponent’s tiles to see what movement is on the other side, having a solid idea of what they are potentially planning for in the next turn or two comes in real handy. Jeremiah—I’d love to try out some of the expansions too, but I have yet to grow tired of the base game. 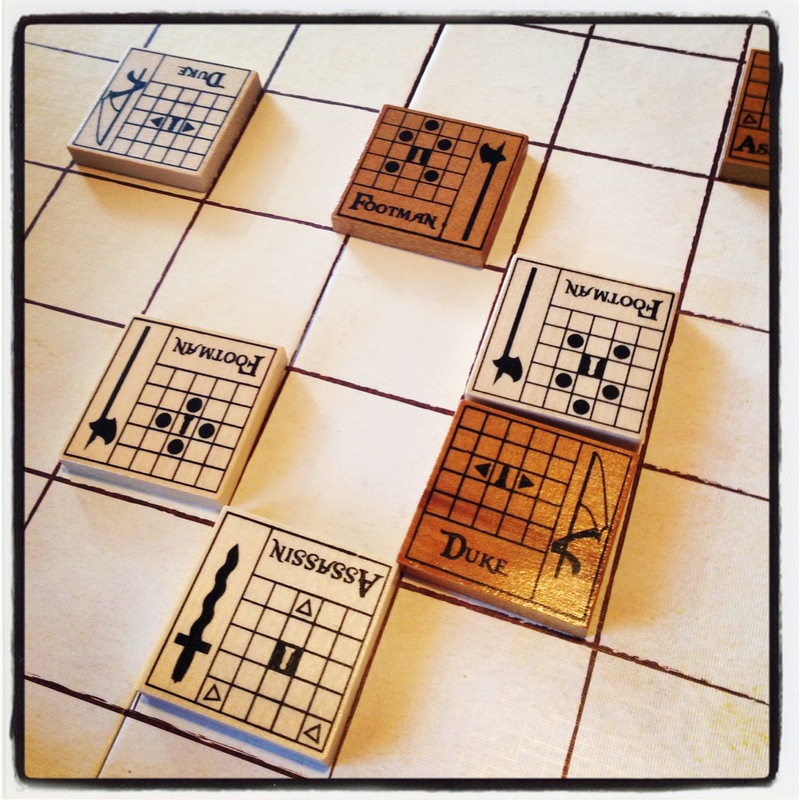 The tile-drawing mechanism makes for extremely high re-playability and variation from game to game. Each game feels the same, but is vastly different. Firestone Final Verdict—If you like abstracts at all, you owe it to yourself to play The Duke. It’s fast (other than the occasional game that goes on longer than normal). It’s easy to teach and learn. Thanks to the tile draws, one person won’t just mop the floor with someone new. Well, they might…but not as much as can happen in chess. The only drawback is that it can sometimes be hard to get a 2-player game to the table—but that’s a small thing. I’m happy to say you should Put This On the Table! Jeremiah Final Verdict—GO BUY THIS GAME! There’s really not much else to say. 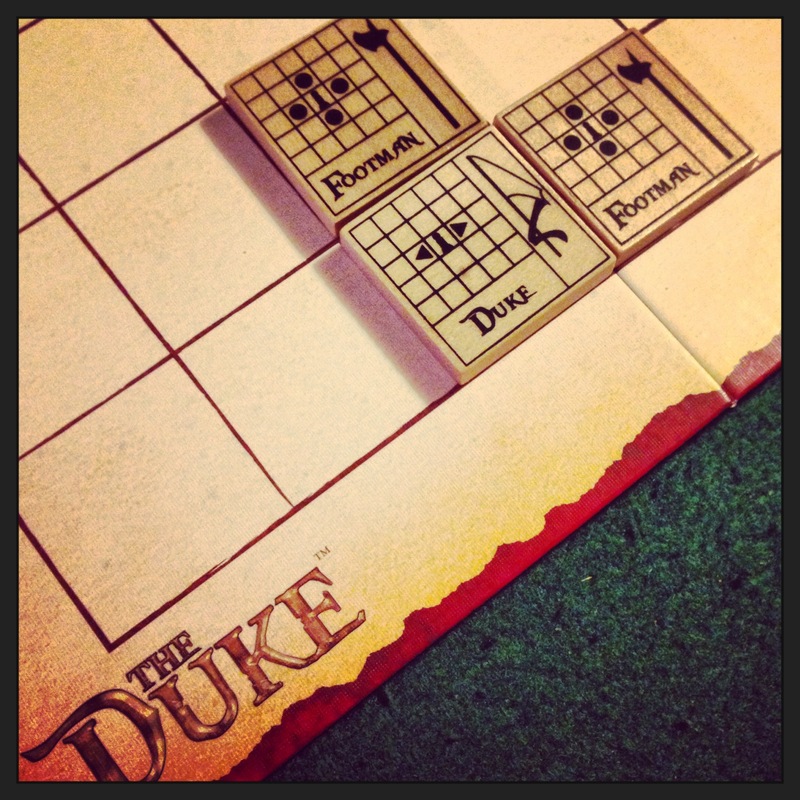 The Duke is beautifully designed, deeply strategic, endless in variation, and lots of fun. Put This On the Table! 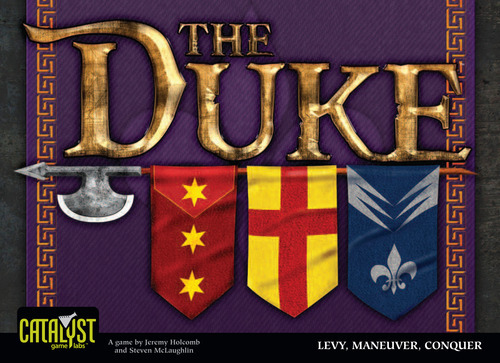 We’d like to thank Catalyst Game Labs for providing review copies of The Duke. This in no way affected our opinions of the game. Thanks for reading! And if you want to see the video review, it’s right below this! Watch it!